Blackheads are actually clogging in the hair follicles of your skin due to sebum and dead skin. Exposure to air causes it to become blackhead while if a clogged pore is closed, it will become a whitehead. The main causes of blackheads are oil, acne bacteria, hormonal changes, clogged hair follicles and more. Soooo irritating, huh! Fortunately, there are other alternatives to painful extraction. Thanks to HiShop, I got to try out this product which has been highly raved by many people due to its efficiency. It's the b.Liv Off With Those Head blackheads sebum gel! b.Liv was created to cater confidence and style for on-the-go youth who love skincare that is easy to use with proven results. Got this off their Facebook page, the logo can be interpreted as "be" and "lieve" or "be" and "live". It's a reminder to always live in confidence, believe in yourself and seize the day. The full-sized bottle is a 30ml plastic bottle with a plastic cap. 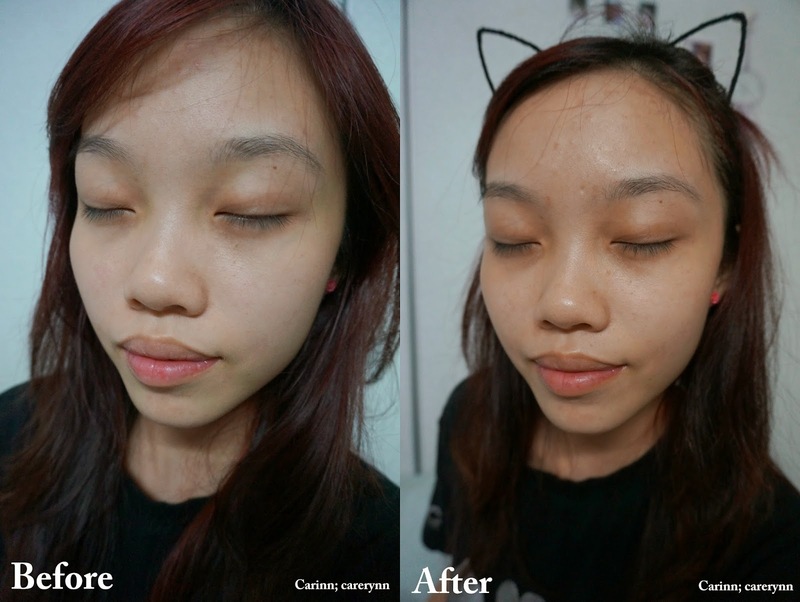 The product is said to be able to clear blackheads and whiteheads in just 14 days, with ease. How it works is, the gel softens the clogged pores, allowing for effortless extraction. It also keeps oil secretion under control and avoids skin irritation. Some of the ingredients include aloe vera (the miracle gel! ), menthol and tea-tree (which is used to cure acne). All their products are biotechnologically formulated for a premium beauty salon experience. And look! There is also a 14-days money-back-guarantee, no questions asked if the product does not work. Just make sure you keep the receipt and have some leftover portions. Comes with a pump for easy control of taking out the product and it's more hygienic too! Inside, it's a colourless gel. Only a small amount is needed to apply on the most commonly affected area such as the nose and chin. Pump 2-3 pea-sized drops of the gel onto your palm and apply it on the T-zone areas or areas affected with blackheads and/or whiteheads. Use daily for two weeks and see the amazing results! What I did though was directly apply the gel on my nose. Not sure if that's ok as well? The gel is easily blendable but leaves a sticky feeling which only lasts for awhile after that. There is a slight cooling sensation and a sweet smell which resembles pineapple to me, idk why! This is my nose (duh, obviously) before and after using the product in just two weeks. Unedited pics! Luckily for me, my blackhead problems are not THAT bad.. I would say it's not a significant change but you definitely can see a difference! I applied the gel every night before my moisturiser and every morning before applying sunblock. Speaking of makeup, I thought that applying the gel would affect my BB cream application but nope, it still stays on perfectly well. Maybe with continued use, it will be more effective. It is said that the blackheads will stop appearing again after using this product but of course, nothing is forever. Let's see how effective it really is after a month! Some precautions are that it is normal for more oil to be secreted during the initial period, but I did not experience this. Also, those with sensitive skin, please try not to apply too much because it may cause a mild stinging sensation. "Don't get mad, get matte!" This mask is an innovative skin-saver that lifts away impurities and excess sebum to combat and control shine while purifying and refreshing your complexion. Some of the ingredients contained witch hazel, peppermint, chamomile flower extract and vitamin A.
Omg was quite surprised to see a black sheet mask when I took it out. The only other black mask that I've tried is a Taiwanese brand so I was super looking forward to trying this out! 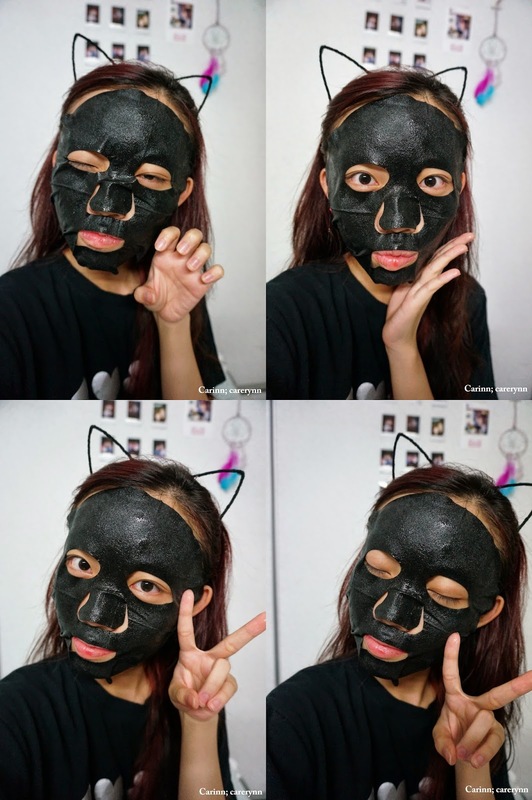 It uses an active charcoal mask sheet that acts like a "magnet" to draw out deep-dwelling pore-clogging dirt to get hours of matte skin. Leave the mask on for 15 minutes. After that, gently massage the remaining essence for 30 seconds, then leave it for another 30 seconds for complete absorption. "But first, lemme take a selfie"
The mask is fits snugly, despite being a little too big for my face at the sides. There is a very cooling sensation when used due to the peppermint. The smell is quite unpleasant to me though, maybe I'm just not a fan of peppermint. Towards the end of the 15 minutes, I can actually feel my skin tightening. Um, my camera setting must have made my skin look different colour on both sides -_- Not sure if it's obvious on camera, but my face is definitely less shiny and brighter after use! My pimples on the forehead have also became less red and less prominent. The mask really does what it claims cos my skin also feels more taut and smooth, but it's a matte kinda smooth. It's a really bizarre feeling! But in a good way. You can get the masks here for RM49.90 for 7 pieces. Quite worth it eh! BUT... I have some good news for you, my readers! Get exclusive rebate of RM20 when you spend RM99 and above on b.Liv products! The code is BLIV2014 and is valid until 30th April 2014. 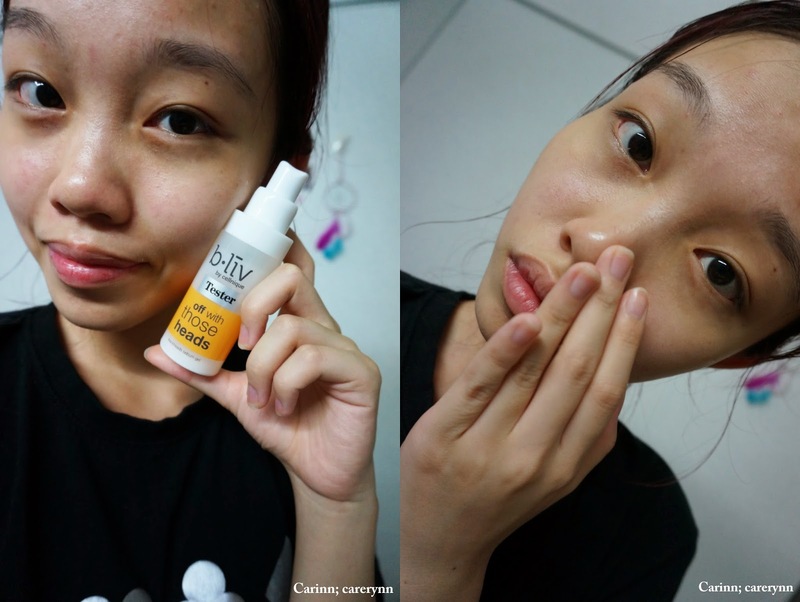 Do check out more of Cellnique and b.Liv products from HiShop here. Also, for more information, check out the links below!